Caring for our marine environment. 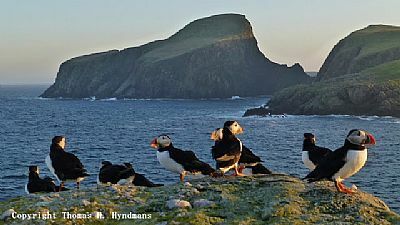 Fair Isle's maritime environment is very rich, both at the natural environment and human community level. The two aspects are inextricably linked and a threat to the first has serious implications for the second. The Fair Isle community has witnessed an erosion of that richness and was concerned that, without concerted action, the resource will be devalued or lost. Fair Isle has a wide range of maritime attributes and issues which are important and deserve urgent measures for these assets to be safeguarded. The Fair Isle Marine Environment and Tourism Initiative (FIMETI) was set up in 1995 by the people of Fair Isle to help achieve this. In 2012, the Fair Isle community presented a petition to the Scottish Parliament Petitions Committee asking for the Council of Europe Diploma condition that - Fair Isle waters should be designated a Marine Protected Area - be honoured and implemented. On 26th October 2016, Roseanna Cunningham, Scotland’s Cabinet Secretary for Environment, Climate Change and Land Reform, announced the designation of the Fair Isle Demonstration & Research Marine Protected Area - Scotland’s first ever designation of this kind. 'FAIR ISLE: MORE THAN JUST A CLIFF EDGE' featuring Inge Thomson - a 25 minute documentary about Fair Isle and the community's MPA proposal. (Filmed in 2014 by Andy Crabb and Peter Cutts (Cape Farewell).